Has India invaded any country in the last 10,000 years? There is a common claim that India hasn't invaded any other country in the past 10,000 years. It has been repeated in chain mails and various web-sites: Example, Example. Other variations exist, such as 5,000 or 1,000 or 100,000 years. If 10,000 years is too much into the infancy of civilization, what about 5000 years when civilization was more established? 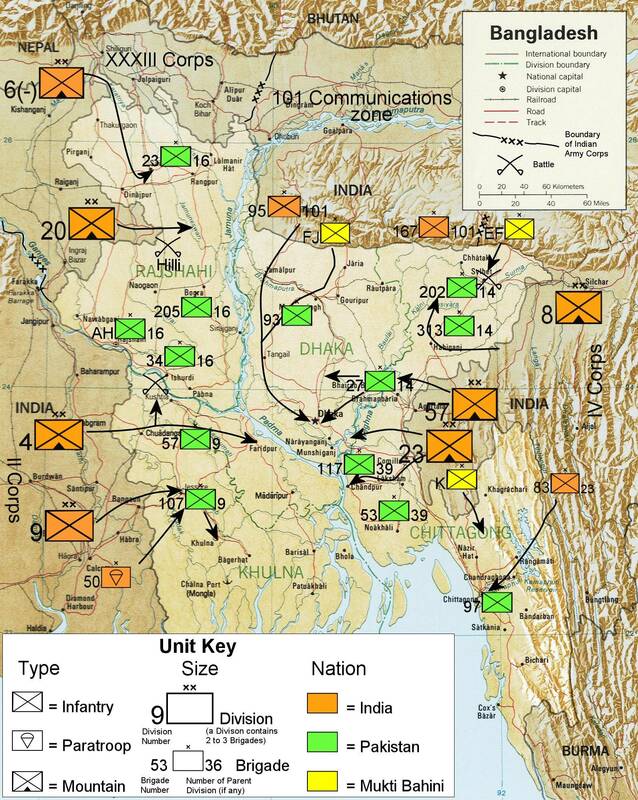 After building tensions during the Bangladesh Liberation war, Pakistan launched a pre-emptive attack against India, which responded with air-strikes. This marked the official start of the Indo-Pakistani War of 1971. Prime Minister Indira Gandhi ordered the immediate mobilisation of troops and launched the full-scale invasion. This involved Indian forces in a massive coordinated air, sea, and land assault. Indian Air Force started flying sorties against Pakistan from midnight. The main Indian objective on the western front was to prevent Pakistan from entering Indian soil. There was no Indian intention of conducting any major offensive into West Pakistan. The invasion didn't last long but troops crossed international borders and engaged in armed conflict with the government of a foreign nation, forcing its surrender. [In 1948] the Indian Armed Forces invaded the State of Hyderabad and ended the rule of Nizam, annexing the state into the Indian Union. 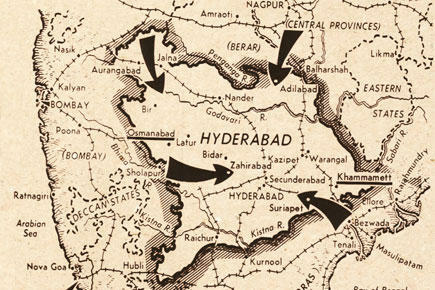 See The Fall of Hyderabad and Indian annexation of Hyderabad (Operation Polo). Since the question asks about the last 10,000 years, we can consider examples prior to the establishment of India as a fully independent state. it was hoped that the invasion would distract German attention and forces from France. The next attempt or Second Battle of Cassino was made by Lieutenant-General Sir Bernard Freyberg’s newly formed New Zealand Corps, consisting of Major-General Tuker’s 4th Indian Division and the 2nd New Zealand Division. Maybe this is a case of irregular verb conjugation: I liberate; You invade; He, She or It fight a border war? It's not an invasion if your motives are good. It's not an invasion if the target is somehow not a country. Motivation is irrelevant. In 1944 Britain and the USA invaded France†. At that time France was governed by a French government (the Vichy government) put in place by the Nazis. The British motivation was the liberation of France from Nazi occupation. They invaded France at the request of the Free-French government in exile. Their motives were good and their actions after 1945 proved this. The word invasion can validly be used where the target is not a country. For example, when a burglar enters my house, it is described as a home invasion. When a journalist listens to the phone messages of a member of the public it is described as an invasion of privacy. In English, the words Country, Nation and State are often used interchangeably. There is a great deal of dispute about what constitutes a country and how many exist. For example which of England, Britain, Great Britain and the United Kingdom are or are not countries? If I invade London, am I simultaneously invading one, two, three or four countries? Another example: Is the Principality of Monaco a country? Would it be nonsense to ask whether Monaco has ever been or could be invaded? Would any violent military takeover of Monaco by a foreign country not count as an invasion under any circumstances? The intent of the above question is best addressed by interpreting country to mean something like the kind of independent sovereign states recognised by the U.N. We should not get hung up over terms like "principality" or "princely state" - we should consider whether they meet common criteria such as internationally recognised borders, independent government and so on. † A great many other nations participated in the invasion of France (or in its liberation if you prefer), I haven't listed them all for brevity - not from a lack of recognition or respect for the scale and value of their contribution and losses. RedGrittyBrick's excellent answer misses a spot. Goa. In 1961, India annexed Portuguese India which included the enclaves of Goa, Daman and Diu, and Dadra and Nagar Haveli. All three elements of the Indian military were utilised in the invasion and successful capture of these three enclaves. The Portuguese PM, Salazar, ordered the Governor General of Goa, Vassalo e Silva, to fight to the last man or to hold out for eight days while he drummed up support against the invasion. Silva managed to hold out for a brief period after which he was forced to surrender as the Portuguese forces were unable to combat the aerial threat of the Indian Air Force. The war lasted two days. India suffered 34 dead and 51 wounded. Portugal lost 31 killed, 57 wounded, and 4668 captured. In an article titled "India, The Aggressor", The New York Times on 19 December 1961, stated "With his invasion of Goa Prime Minister Nehru has done irreparable damage to India's good name and to the principles of international morality." India tried to give the invasion a different spin by calling it a police action rather than a war. So, to answer the OP's question, yes, India has invaded at least one country in the last 10,000 60 years. The Maurya Dynasty (322BCE - 185BCE) was an empire that controlled most of the Indian peninsula and extended as far East as modern day Myanmar and as far West as modern day Iran. The Empire was founded in 322 BCE by Chandragupta Maurya, who had overthrown the Nanda Dynasty and rapidly expanded his power westwards across central and western India taking advantage of the disruptions of local powers in the wake of the withdrawal westward by Alexander the Great's Greek and Persian armies. By 320 BCE the empire had fully occupied Northwestern India, defeating and conquering the satraps left by Alexander. Under Chandragupta, the Mauryan Empire conquered the trans-Indus region, which was under Macedonian rule. Chandragupta then defeated the invasion led by Seleucus I, a Greek general from Alexander's army. Under Chandragupta and his successors, internal and external trade, agriculture and economic activities, all thrived and expanded across India thanks to the creation of a single and efficient system of finance, administration, and security. 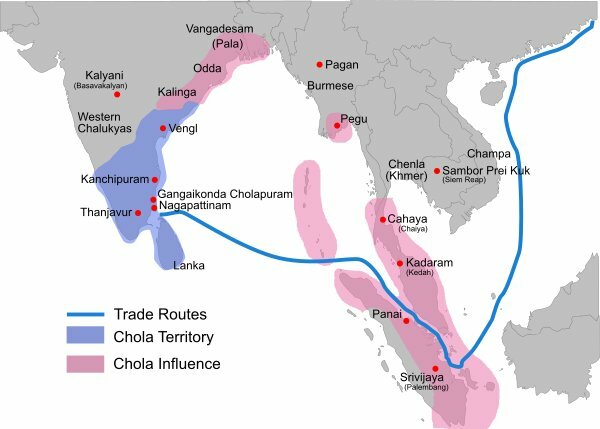 According to Wikipedia, Chola empire ran several conquests to invade various parts of Asia including present-day Bangladesh, Myanmar, Sri Lanka, Malaysia, and Indonesia. The Chola navy played a vital role in the expansion of the Chola Empire, including the conquest of the Ceylon islands and Sri Vijaya (present day Indonesia), the spread of Hinduism, Dravidian architecture and Dravidian culture to South east Asia and in curbing the piracy in Southeast Asia in the 900CE. There is evidence to suggest that even at the time of Parantaka I, there was a considerable navy involved in the numerous invasions of Lanka. Rajendra Chola's naval victories in Srivijaya were a culmination of centuries of naval tradition. Not the answer you're looking for? Browse other questions tagged history india . Has Britain invaded most countries in the world? When is the origin of Datura in India? Has Barack Obama achieved these goals in the last six years? Is visiting a banned torrent site punishable by 3 years jail in India? Was the Speed of Light known in 13th century India? What was the real reason for India pulling out of the 1950 World Cup? Is this meme about the former prime minister of India true? Did India shoot down any Pakistani F-16 on 27th February 2019?